The Urban Politico: Eeny Meeny Mini Moe! 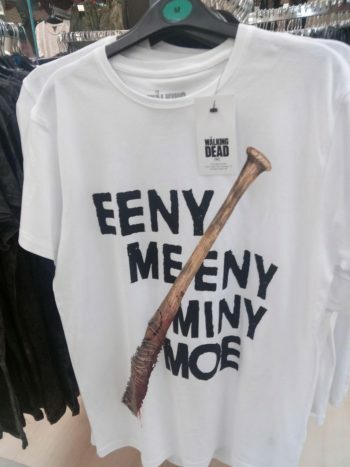 He said: "The slogan is “Eeeny meenie miny moe…..” It stops there, but of course we all know what the original said: “catch a n***** by his toe." "The graphic has a large American baseball bat, wrapped round with barbed wire, and covered with blood. This image relates directly to the practice of assaulting black people in America. "It is directly threatening of a racist assault, and if I were black and were faced by a wearer I would know just where I stood." The slogan comes from the final episode of the sixth series of the critically acclaimed horror drama in which zombies have overrrun a post-apocalyptic world. Now a couple of things come to mind here. It is true that some versions of that rhyme have racial slurs included. It's also true that there are very few traditional rhymes or poems or limericks that haven't been altered or changed at some point, sometimes in unpleasant ways. Once something is in the public square it's fair game for everyone. Just ask Andrew Dice Clay. But for what it's worth the original version of eeny meeny miny moe likely predates the United States and didn't include racial slurs. The version I heard growing up used "tiger" instead of "n*****". I can't speak for what other people's experiences were, either in the US or the UK. It may be a question of age here. I do think it's a bit over the top to think that chanting eeny meeny miny moe automatically means that you are a violent racist who is on the verge of initiating beatdowns and organizing pogroms against any black people in the near vicinity. That's the sort of paranoid thinking that was lampooned pretty accurately in the film Undercover Brotha. In 2003 two (American) black women sued Southwest Airlines for intentional infliction of emotional distress because the (white) flight attendant announced "Eenie meenie mini mo! Pick a seat! We gotta go!" The women lost their case. So obviously there are some people who have heard racist versions of the rhyme. I have no issue with black people or well meaning non-black allies being on the lookout for racism. Racism is real. As the saying goes just because you're paranoid doesn't mean they aren't out to get you. But in this case I think that Lucraft overreacted. Stuff like this only feeds the arguments of those who believe that anti-racists are censorious snowflakes who cry wolf every time they see a chihuahua. The gear of the LA Dodgers, the Oakland Raiders and Fresno State Bulldogs has been popular with certain gangs. But we certainly can't say that the only possible reason for someone to wear such clothing is to show their gang affiliations. Sometimes a cigar is just a cigar. Sometimes a t-shirt is just a t-shirt. Jeffrey Dean Morgan put it more bluntly.